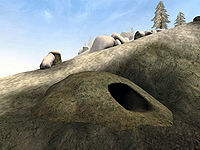 Skygge is a small ice cave located west of Skaal Village and north of the bridge across the Isild River. The entrance is at the river mouth on the eastern shore. Skygge has only one interesting weapon: the Staff of Carnal Channeling, a staff used by the Rogue Necromancer, who also carries a personal journal. There are two other necromancers and up to four other creatures: wolves, draugr or skeletons. The only other loot is in crates and barrels, and consists of some pieces of iron armor, a couple of bottles of skooma, and plenty of random items. Skygge means Shadow in Danish and Norwegian.